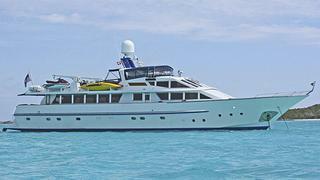 The 34.14 metre motor yacht Sentimental Journey is sold with Michael Rafferty at Camper & Nicholsons acting for both seller and buyer. Sentimental Journey was built in aluminium by Australian yard Lloyds Ships with delivery in 1983 and both Lloyds and Fratelli Benetti collaborated on her wider design, with the naval architecture by Lloyds. The subject of numerous upgrades over the years, she was refitted by Delta Marine in 2009. Her interior was designed by Hampton Interiors to be comfortable and luxurious. She accommodates 12 guests in six cabins plus six crew. The guest accommodation consists of a master suite with a king sized bed, a VIP suite with a queen sized bed, two doubles and two twins, all with flat screen televisions and full en suite facilities. A large flybridge is dedicated to al fresco entertaining and relaxation with a Bimini top, barbecue, Jacuzzi spa, bar and ice makers. A true bluewater cruising yacht, she has a range of 3,000 nautical miles at 9 knots and her twin 250hp Gardner engines give her a maximum speed of 10 knots.